It has been a while since we had a one-two-almost-three punch snowstorm. On the Wednesday before the storm, I had a meeting at 6 p.m. and then another at 6:30 (I was about 15 minutes late for the second one). In the first, my condo board meeting, we talked about the fact that snow was on its way. We tried to figure out whether it was really going to be a tough one, or not. I felt it might be a real one, and I was prepared. Plenty of food for the cats (because, after all, they could not care less as long as they had a few warm velour throws, a clean litter box and cans of Fancy Feast to go with their dry food). I do have a freezer full of people food, but that freezer is in the garage, a good walk easy when the weather is good but possibly not so if it really does snow for hours and hours. As it turned out, it snowed for around 10 hours and I couldn‘t get out of my condo for another half a day (except to shovel a path from my back door to the bird feeders). But I had decided I wanted to cook. It is actually my therapy, whether the weather is too hot or too cold, or too snowy. I had gotten chicken thighs from the freezer the day before and bought a big chunk of beef chuck and some ground meat for chili. For two of the recipes I used my slow cooker. I bought my first just after my first marriage dissolved; my new one I have had for about eight years; I love my slow cooker although I usually sear the meat that will go into the crock pot these days. The chicken thigh recipe was more work than it was worth The pot roast was amazing (I added almost everything except the kitchen sink including half a can of Campbell’s tomato bisque from the fridge.) The chili, for which I used a package of Wick Fowler’s 2-Alarm Fire Chili, was yummy. But a few days later, I wanted something sweet. Not chocolate, though. I found this recipe I had saved from the New York Times years ago. Boy, are these addictive. 1. Center a rack in the oven and preheat the oven to 350 degrees. Butter a 13-by-18-inch jelly roll pan, including sides. 2. To make the crust: in a mixer with a paddle or in a bowl with a rubber spatula, best ½ (one-half) plus 2 tablespoons butter and all the brown sugar together until smooth. Stir salt into flour, then add flour to butter and sugar mixture. Mix until dough is well combined but still crumbly; if dough is mixed until a ball forms, crust will be tough. 3. Pat the dough evenly along bottom of buttered pan, taking care not to pack the dough down. Place pan in oven and bake 5 minutes. With a fork, prick dough deeply all over. Return pan to oven and bake until sough is lightly browned, dry and no longer soft to the touch, about 7 minutes. Transfer to a cooling rack; do not turn off the oven. 4. To make butterscotch topping: In a large saucepan, combine remaining 3 ½ (three and one-half) tablespoons, butterscotch chips, corn syrup and 1 tablespoon plus 2 ½ (two and one-half) teaspoons water. Place over medium heat and cook, stirring constantly, until butter and butterscotch chips are melted, about 5 minutes. Pour topping over crust, using a spatula to spread, evenly all the way to the corners. Sprinkle cashew pieces on top, pressing down light. 5. 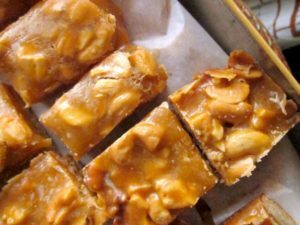 Bake until topping is bubbly and cashews are lightly browned, 11 to 13 minutes. Transfer to a rack and cool completely before cutting into two-by-three-inch bars.